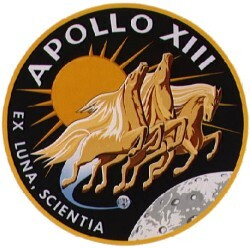 The spacecraft was the second of the Apollo H-series. The purposes of the mission were (1) to explore the hilly upland Fra Mauro region of the moon, (2) to perform selenological inspection, survey, and sampling of material in the Fra Mauro formation, (3) to deploy and activate an Apollo lunar surface experiments package (ALSEP), (4) to further develop man's capability to work in the lunar environment, and (5) to obtain photographs of candidate lunar exploration sites. These goals were to be carried out from a near-circular lunar orbit and on the lunar surface at 3 deg S latitude, 17 deg W longitude. Although the planned mission objectives were not realized, a limited amount of photographic data was obtained. Lovell was a Navy captain on his fourth spaceflight (he'd flown previously on Gemini 7, Gemini 12, and Apollo 8), Haise and Swigert were both civilians on their first spaceflights. The backup crew was John Young, Charles Duke, and John Swigert (who replaced Thomas Mattingly on the prime crew after the crew was exposed to German measles). The Apollo 13 Command Module "Odyssey" is now at the Kansas Cosmosphere and Space Center, Hutchinson, Kansas. It was originally on display at the Musee de l'Air, Paris, France. Apollo 13 was launched on a Saturn V on 11 April 1970 from pad 39A at Kennedy Space Center. During second stage boost the center engine of the S-II stage cut off 132 seconds early, causing the remaining four engines to burn 34 seconds longer than normal. A television broadcast was made from Apollo 13 from 02:24 UT to 02:59 UT on 14 April and a few minutes later, at 03:06:18 UT Jack Swigert turned the fans on to stir oxygen tanks 1 and 2 in the service module. The Accident Review Board concluded that wires which had been damaged during pre-flight testing in oxygen tank no. 2 shorted and the teflon insulation caught fire. The fire spread within the tank, raising the pressure until at 3:07:53 UT on 14 April (10:07:53 EST 13 April; 55:54:53 mission elapsed time) oxygen tank no. 2 exploded, damaging oxygen tank no. 1 and the interior of the service module and blowing off the bay no. 4 cover. With the oxygen stores depleted, the command module was unusable, the mission had to be aborted, and the crew transferred to the lunar module and powered down the command module. To conserve power and other consumables the lunar module was powered down except for environmental control, communications, and telemetry, and passive thermal control was established. 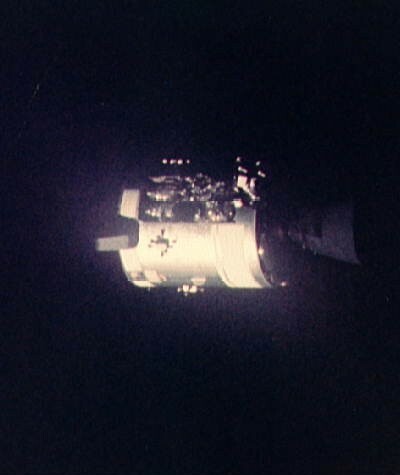 The service module, which had been kept attached to the command module to protect the heat shield, was jettisoned and the crew took photographs of the damage. The command module was powered up and lunar module was jettisoned. Any parts of the lunar module which survived atmospheric re-entry, including the SNAP-27 generator, planned to power the ALSEP apparatus on the lunar surface and containing 3.9 kg of plutonium, fell into the Pacific Ocean northeast of New Zealand. 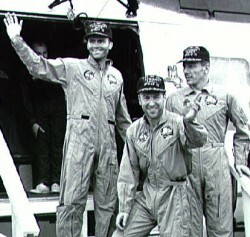 Apollo 13 splashed down in the Pacific Ocean on 17 April 1970 at 18:07:41 UT.